We have 2 ft (60cm) high retaining wall and 2 ft behind the retaining wall is a 4 ft (1.2m) high fence. Naturally there is backfill with 5/8" crushed stone directly behind the wall. This backfill goes back 1 ft (30cm), but only goes to a height of 9 inches (23cm) from the top of the topmost retaining wall block. 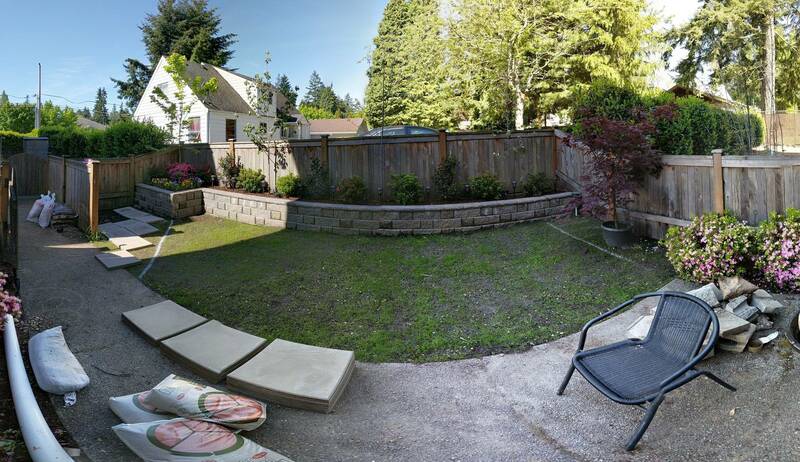 We would like to plant trees at 6 ft (1.8m) apart (centered between fence posts) for some privacy from our neighbors. We live in a 3 story town-home so the trees have to be reasonably tall (10-12 ft [3m]?) to be effective. We would like to plant 3 Japanese Maples (Blood Good) along the wall around 6 ft apart (and a Golden Raindrops in the larger corner). We want to buy the trees when they are already at a height of around 10 feet with a rootball of around 2 feet. As you can see, the roots can grow outwards, backwards (under the fence), downwards, but will be blocked from growing forwards. My question is what can we do to maximize the success here.. or is it a lost cause? We live in Seattle, USA. There is a french drain behind the wall with crushed stone and geo-material for drainage. In the picture you can see the drain protruding out of the wall. We can certainly protect the fence from the soil using water proofing material, thanks for the suggestions on this! Our thoughts were the tree roots would grow under the fence (backwards) as far as they wanted, out to the sides and downwards. Naturally there would be no roots growing forward and this was our primary concern. It's not clear from the photo but the neighbors yard is dirt behind the fence. I did not realize the concrete they've spread would make the pH of the dirt unsuitable. Thanks for this info - is it a hopeless pH issue? NOOOOOO!! Do not plant trees below that wall. There is no room on your little wall. Imagine a Japanese Maple you are hoping to grow. The same size canopy equals the same size root ball below! This is fine for perennials and small shrubs but NOT trees of any sort! I assume you will be filling that space behind the wall with soil?!!?? Soil up against that fence will mean replacement of that fence within a year or two. So not even good for any kind of plants. Soil has to be kept minimum of 4" below wood, fences, siding...etc. You'll have to get pressure treated 2X12 lumber to shore up the bottom of your fence and ideally your neighbors need to be invited into the decision making! If you make an identical wall along the back on the fence you HAVE to get a liner between the fence and the concrete. Also, don't imagine planting acid loving plants in your new 'planter' as that concrete will make the soil more alkaline no matter how hard you try to change the pH. Nice wall, nicely done. Tell us more about your plans. Did you provide any drainage for this wall? What did you plan to do between the fence for the back half of this 'planter'? We can still help...you've done an awful lot of work and very nice wall! How about a wall for seating? More information! place 4" drain pipe with sleeve at the inside base of the wall. Cover with landscape fabric or geotextile. This will ensure good drainage at base of the wall. consider putting EPDM pool liner between soil and any wood. This will help prevent rot. Any wood, pressure treated or not, will rot when in contact with the soil. It's just a question of how long it takes. Replacing posts on a post would mean a lot of work which could easily involve digging up your bed. Will dumping paint destroy a nearby tree? How can I remove a bush whose roots are breaking concrete? Where can I get info on rescapeing my small backyard? How should I deal with tree root pushing on brick retaining wall? 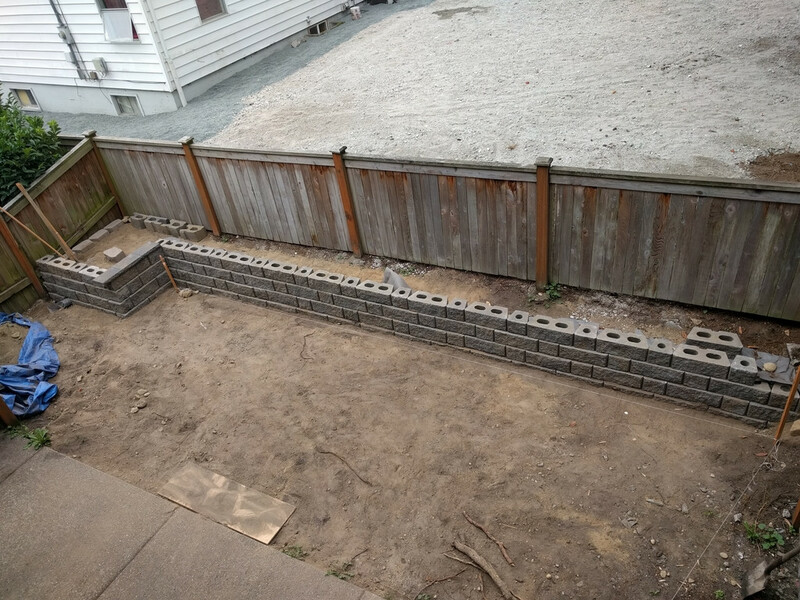 French Drain Below or Above Retaining Wall?